In my mailbox on October 14th, 2013. 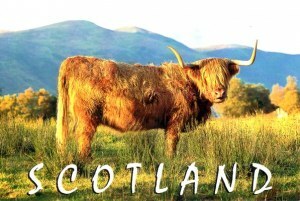 Highland cattl are a Scottish breed of cattle with long horns and long wavy coats which are coloured black, brindled, red, yellow ordun. The breed was developed in the Scottish Highlands and Western Isles of Scotland. Breeding stock has been exported to the rest of the world, especially Australia and North America, since the early 20th Century.